The first gig for the band is coming up on August 7th at House of Blues in San Diego- and we’re as ready as we’re ever going to be. I’m really excited! 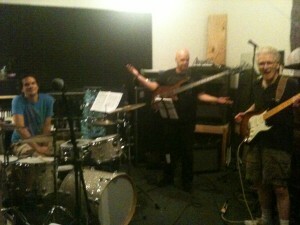 How can I go wrong with the lineup of Steve Sykes (guitar), Doug Lunn (bass), and Kevin Stevens (drums). Oh , and there’s me, too -fronting the band with guitar and vocals. The past couple of months have been fairly busy for me, with teaching and working on song arrangements for my band. There’s now a total of twelve songs ( a set’s worth of material) with charts to follow. Having a “book” will allow it to be easier to bring in different musicians. Good news is, the band has a name (for now)….BRIO. That about covers it for me! This month is already starting off to be a good one. I’ve had the opportunity (privilege) of playing with some great players these past couple of weeks and know that when the band does come together- it will be killer! Back in LA, I’m recording demos of the two new songs I’ve just written and teaching them to the “band” . The band (besides myself and Steve Sykes) pretty much has a bass player , but is still looking for the right drummer….and the right name! Hopefully , this will work itself out because I want to do some live shows before I go into the studio to cut my CD , which was planned to take place in Spring/Summer of this year. Right now, I’m hanging on for the ride! The last couple of years , there were a lot of unexpected turns that occured in my career life. I was asked to sub for a guitar teacher which turned into a part time occupation – which in turn prepared me for what was to come next. Giving guitar clinics to crowds at The CMS (Christian Musician Summit) and various Guitar Shows. A featured article called “The Passion of Playing” in Christian Musician Magazine (Jan- Feb 2011) followed, and that was the beginning of being active in the public eye again. It was during this time, I was hired to do something else new. To write, perform and produce ten cues for a tv/film library.This was one of the funnest , creative times I’ve had in a long time! Maybe it it will even turn out to be financially rewarding, too. Skipping ahead to the New Year 2012, I decided now was the time to play live again and put a CD out of my own material . Now, to think about a band….. I am thrilled about my musical pairing with guitarist/engineer/ producer, Steve Sykes . 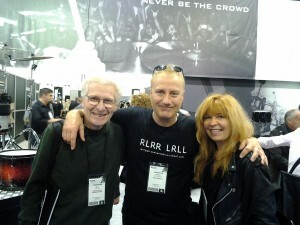 I had met Steve in the 80’s and worked with him when I joined The Babys. I hadnt seen him until a couple of years ago when I ran into him at a club. Between the two of us , we know a lot of great musicians in the L.A. area, but finding the right bass player and drummer who are available is not so easy. I’m not worried , though. In fact, I’m excited ! Until the rest of the band is discovered, Steve and I have been working on really cool two-guitar arrangements.Since the band line-up I want is 2 guitars, bass and drums it’s really important that the guitars have a unique voice to them. And… they do.